12:00 p.m. - QuickNewHavenNews and CountyNewsLIVE are on the scene of a fully-involved structure fire in the 2800 block of Diederich Rd. in rural Berger. Crews from the Hermann Volunteer Fire Department and Chief Dave Schulte are on the scene, too. Washington, Mo. 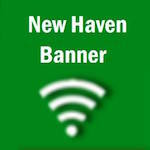 firefighters have also been requested by New Haven-Berger Chief Wayne Carl. It appears the fire started in the attached garage. By the time the first firefighters arrived, the garage and a breezeway connecting the house to the garage were fully engulfed. Fire was seen on the second floor of the house and smoke was curling-up from the roofline, a frequent sign that there is fire in the attic. At 12:30 p.m., black smoke was coming from a window on the second floor, in the center of the house. At about 12:30 p.m., several Hermann firefighters were suited-up with air tanks and went into the burning house to fight the fire from within. At about 2:45 p.m., Firefighters still on scene, but fire has been extinguished. The house sustained major damage as seen in the photos. At 3:50 p.m., Hermann Fire Chief Dave Schulte spoke with CountyNewsLIVE.com from the Hermann #2 fire house. Schulte said there was extensive fire damage to the attic of the residence and the second floor, but fire was kept from reaching the first floor. However, there is extensive water and smoke damage on the first floor. The structure may be a loss, but substantial personal property on teh first floor appears to have been spared. Schulte said seven firefighters from Hermann worked the fire. He said five of his firefighters went into the burning building with air tanks. Each firefighter used-up two air tanks. According to Franklin County Dispatch, the fire is currently under investigation.